Here is the simplest (and most common) scenario: Debtor borrows money or obtains credit from Creditor, signs a note and security agreement putting up collateral, and promises to pay the debt or, upon Debtor’s default, let Creditor (secured party) take possession of (repossess) the collateral and sell it. Figure 11.1 "The Grasping Hand" illustrates this scenario—the grasping hand is Creditor’s reach for the collateral, but the hand will not close around the collateral and take it (repossess) unless Debtor defaults. 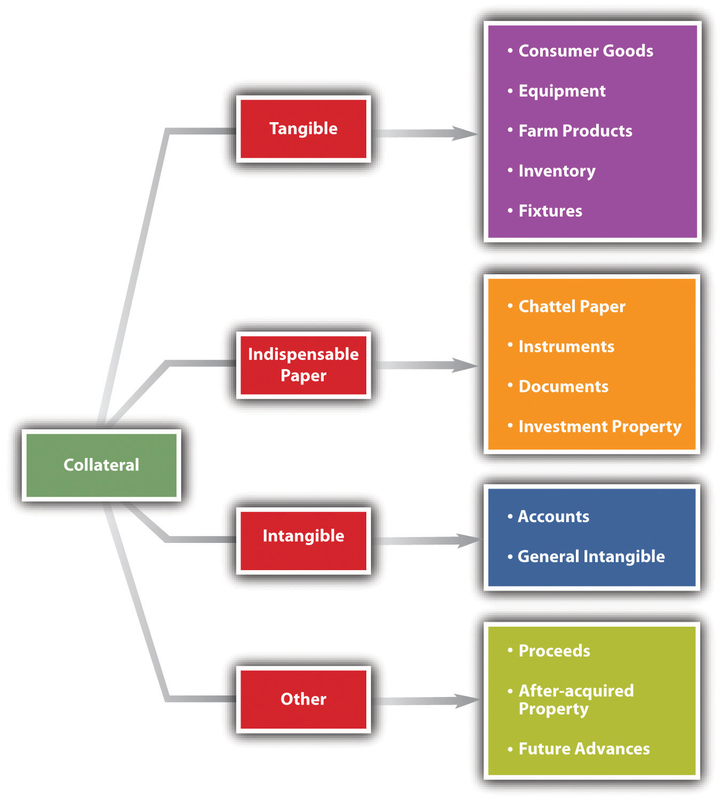 See Figure 11.2 "Tangibles and Intangibles as Collateral". AttachmentThe process by which a security interest becomes enforceable against the debtor with respect to the collateral. is the term used to describe when a security interest becomes enforceable against the debtor with respect to the collateral. In Figure 11.1 "The Grasping Hand", ”Attachment” is the outreached hand that is prepared, if the debtor defaults, to grasp the collateral.Uniform Commercial Code, Section 9-203(a). 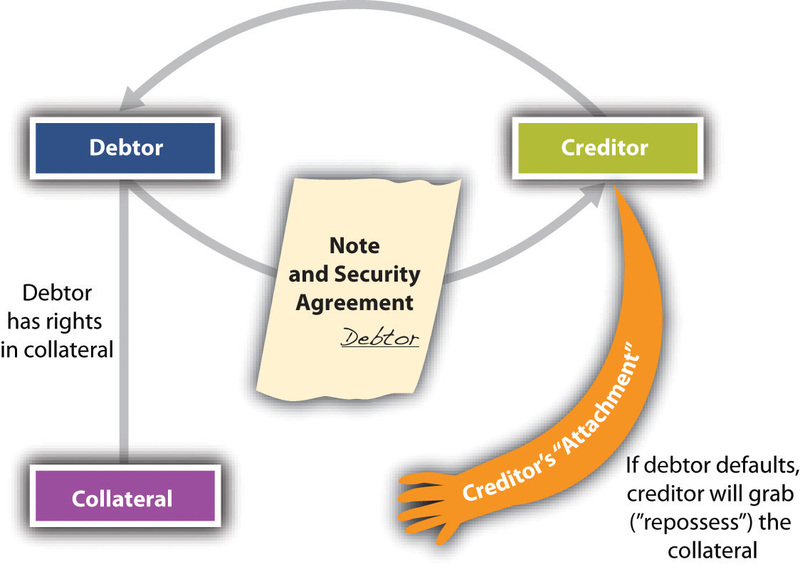 Again, Figure 11.1 "The Grasping Hand" diagrams the attachment, showing the necessary elements: the creditor gives value, the debtor has rights in collateral, and there is a security agreement signed (authenticated) by the debtor. If the debtor defaults, the creditor’s “hand” will grab (repossess) the collateral. The form of the financing statement may vary from state to state, but see Figure 11.3 "UCC-1 Financing Statement" for a typical financing statement. 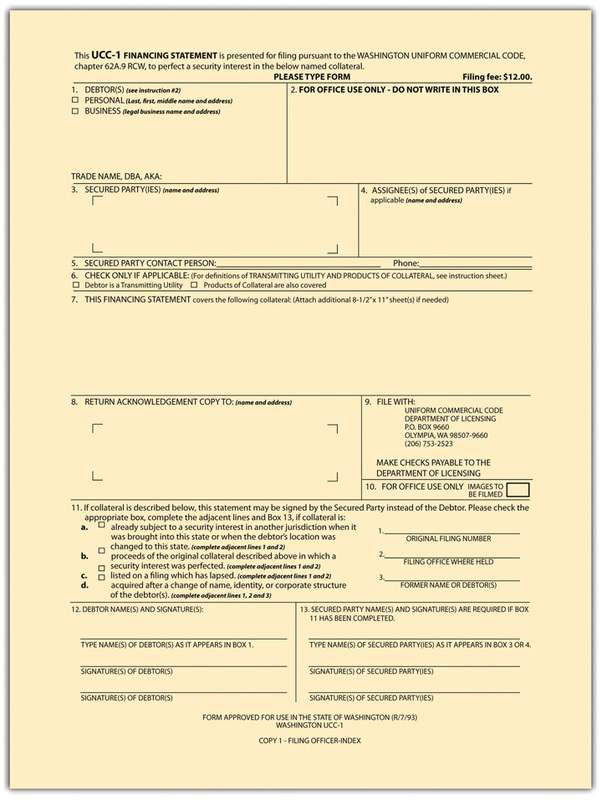 Minor errors or omissions on the form will not make it ineffective, but the debtor’s signature is required unless the creditor is authorized by the debtor to make the filing without a signature, which facilitates paperless filing.Uniform Commercial Code, Section 9-506; Uniform Commercial Code, Section, 9-502, Comment 3.